The article explores and discourages the use of antibiotics, and explains that the recent advent of reactive oxygen species (ROS) technology means that topical antibiotics and antiseptics could be replaced with recently developed agents such as SurgihoneyRO™. 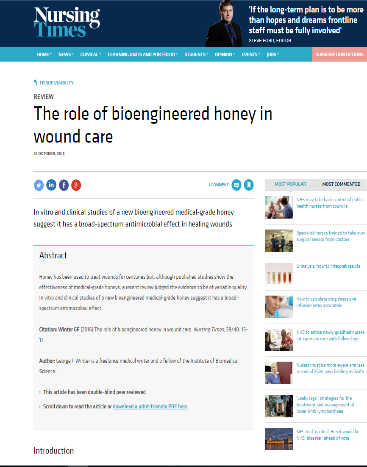 In vitro and clinical studies of a new bioengineered honey demonstrate it has a broad-spectrum antimicrobial effect in healing wounds, compared to normal Honey and other Manuka products. 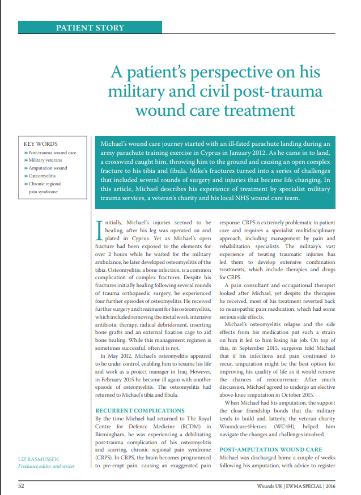 This article explore Michaels story, which started with an ill-fated parachute landing result in an open fracture to him Tibia and Fibula. Due to reocruring infections and pain, the best choice for Micheals quality of life was leg amputation. SurgihoneyRO™ was used on Michaels amputation wound to help with the healing process. 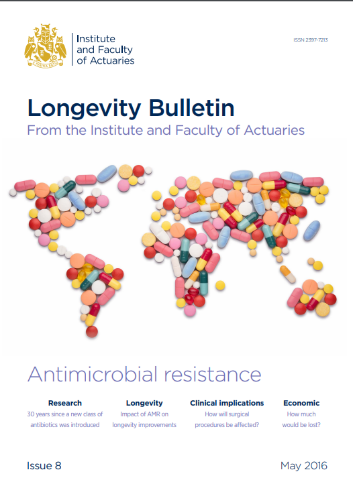 Longevity Bulletin, Institute and Faculty of Actuaries. 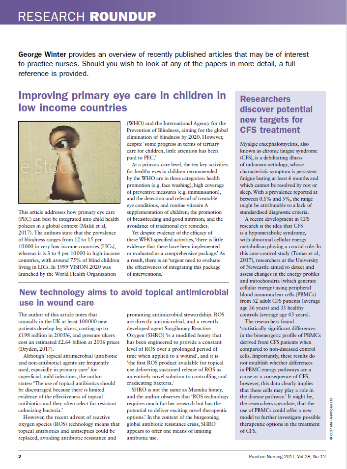 Dame Sally Davies, Chief Medical Officer for England, writes the foreword while the patient case study (page 24) highlights SurgihoneyRO™ as a new solution. The powerful antimicrobial agent can eradicate even the most drug-resistant bacteria (NDM-1-E.Coli and CPE), improve healing, reduce risk of transmission to other patients & the need for last-resort antibiotics. 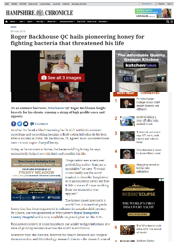 Roger Blackhouse was faced with a life-threatening battle with antibiotic-resistant superbugs and necrotising fasciitis. Amputation was a probability but SurgihoneyRO™ helped Roger keep his limb. 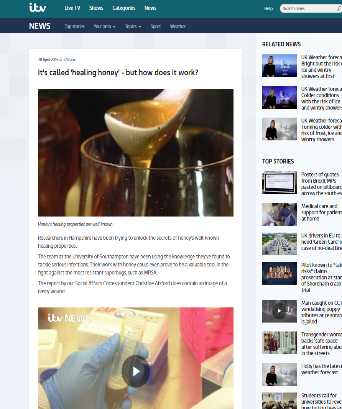 Its called ‘healing honey’ – but how does it work? 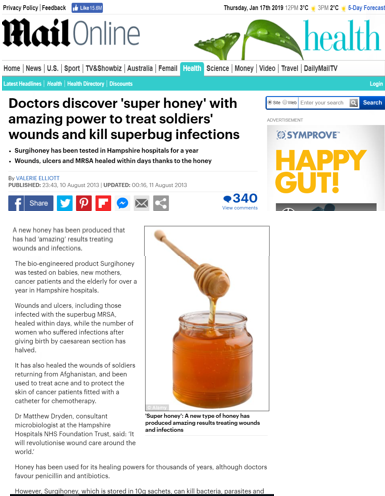 Daily Mirror article describes how SurgihoneyRO™ can be used instead of antibiotics to clear bacteria from wound infections. 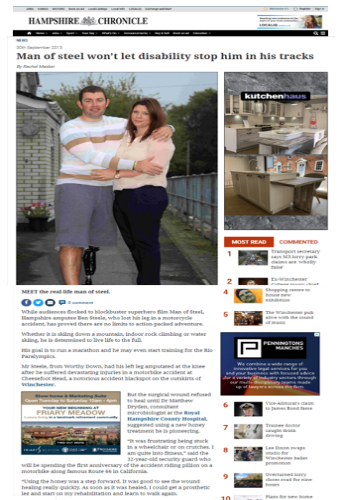 The article includes two case studies – a retired QC with necrotising fasciitis in his foot and a young veteran amputee soldier. The article was also published in the New Day, the new national newspaper. 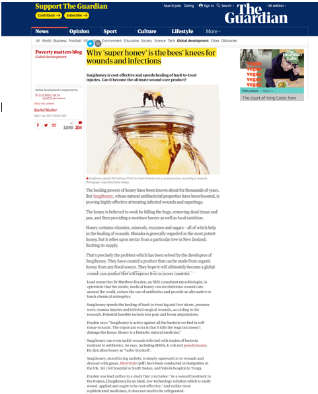 SurgihoneyROTM won The Guardian newspaper’s Innovation Series in January 2014 with an article ‘Why superhoney is the ‘bees knees’ for wounds and infections.’ The series highlighted 12 of the most eye-catching innovations in the developing world over the past year with potential to improve lives. Readers were able to vote for their favourite innovation and SurgihoneyRO™ won with a massive 58% of the vote. Mr Steele, from Worthy Down, had his left leg amputated at the knee after he suffered devastating injuries in a motorbike accident. 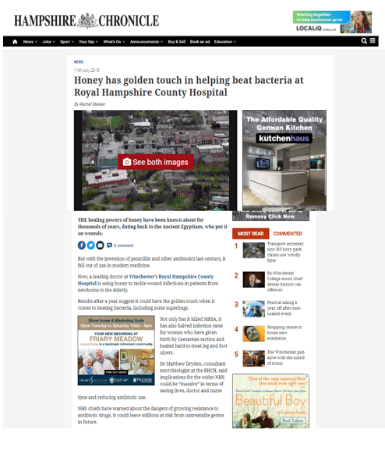 The surgical wound refused to heal until Dr Matthew Dryden, consultant microbiologist at the Royal Hampshire County Hospital, suggested using SurgihoneyRO™. SurgihoneyRO™ played a key role in healing an amputee’s critically infected stump wound. 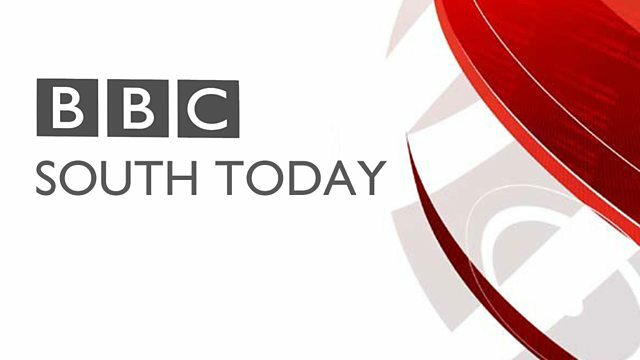 BBC South Today reports on the effects of SurgihoneyRO™ and its effectiveness against infections found in soft tissue wounds, including multi resistant bacteria like MRSA and E-Coli. 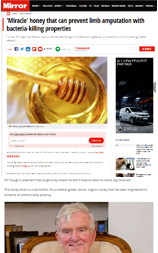 Doctors discover bio-engineered honey heals chronic wounds and kill superbugs. Honey has a golden touch in beating bacteria, including some superbugs.